Please contact us for obedience and field training of your pup or young dog. 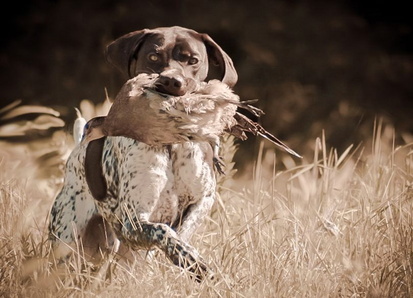 Beacon Hill Shorthairs specializes in the breeding, training and raising of quality German Shorthaired Pointers for the upland bird hunter and active family. 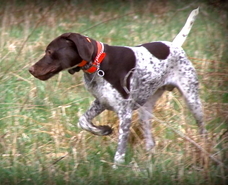 We are committed to enhancing the breed and strive to produce German Shorthairs with strong natural hunting abilities, cooperative, loving personalities, breed standard conformation, and striking physical beauty. Our litters are registered with the American Kennel Club (AKC) and the North American Versatile Hunting Dog Association (NAVHDA). Beacon Hill Maximum Overdrive received a Prize 1 during the North American Versatile Hunting Dog test for Natural Ability. Max was tested in Nose, Search, Pointing, Tracking, Water, and Cooperation. Max worked hard and received the top score in each category. He also attained a best score in Water/Swimming. Max garnered a total of 112 points which is the maximum test score. We are very proud of Max and he is showing great promise for such a young pup. Max is out of Morgen's second litter. He will compete for AKC Junior Hunter title this Spring. Max will be available for stud in 2015. © 2018 BEACON HILL SHORTHAIRS, a division of BEACON HILL FARM. PLEASE DO NOT COPY THE CONTENT OR PHOTOGRAPHS ON THIS SITE WITHOUT OUR WRITTEN PERMISSION. Content is the property of Beacon Hill except where otherwise noted. ALL RIGHTS RESERVED. Not responsible for errors or omissions.